What would the chemical elements look like as cartoon characters? For her senior thesis project for the Milwaukee Institute of Art & Design, animator and illustrator Kaycie D. decided to take on a massive character design project. 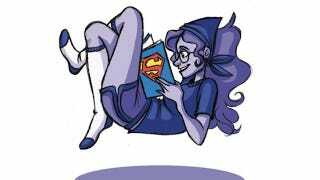 She would design a character based on each of the known chemical elements in the periodic table, until she had a complete world of science-inspired cartoon characters. Elements: Experiments in Character Design sprang from Kaycie D.'s experience in chemistry class. After watching a video in which the narrator personified some of the elements, she began drawing different elements as human characters (and inventing stories for them). So she decided to expand on that passion for her thesis, taking a characteristic of each element, or the story behind the element's name, and creating a character based on that. Consequently, some of the elements are suit-wearing scientists or characters from Greek mythology, but many of them are fantastical heroes and villains. Perhaps someday Kaycie D. will grace us with some of the stories she's cooked up for these chemical characters.